Can Apple Profit From Adding Virtual Reality to Self-Driving Cars? Apple has patents for virtual reality in autonomous cars. The autonomous driving race continues to accelerate. 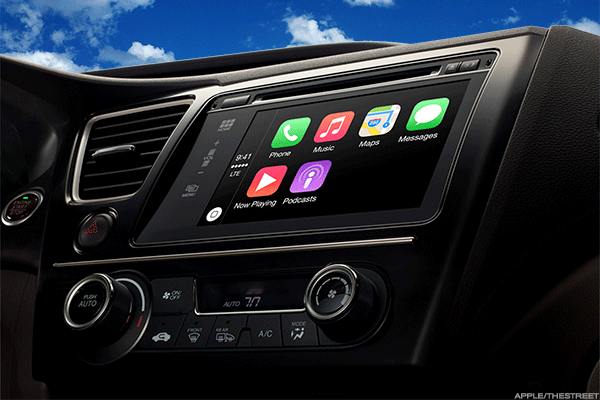 With seemingly every automaker involved, even technology stocks are in on it. From Nvidia Corporation (NVDA - Get Report) , Alphabet Inc. (GOOG - Get Report) (GOOGL - Get Report) , Intel Corporation (INTC - Get Report) and dozens of others, they don't plan to let the opportunity go by either. One notable player that's been absent, though? Apple Inc. (AAPL - Get Report) . It's the largest tech company in the world, with a market cap approaching $1 trillion. And yet, its autonomous driving plans are virtually nonexistent. That is, until recently. The company tried to pair up with Audi, then Mercedes. Both said no, as Apple wanted too much control over the customer experience. Those who know Apple shouldn't be surprised by that desire given its other products. However, while Alphabet's Waymo has been running an autonomous taxi pilot in Phoenix for a year now, Apple could barely get a partnership worked out. Alphabet's got millions of real-world test miles under its belt and billions of synthetic test miles to go along with it. It just signed a deal with Fiat Chrysler (FCAU - Get Report) for more than 60,000 vehicles and is looking for a partner in Europe as we speak. Apple? Working on launching some autonomous shuttles around campus after coming to terms on a partnership with Volkswagen for some of its T6 Transporter vans. Even that project is likely to be completed before the end of the year. In other words, Apple's been far from a game-changer in the early innings of autonomous driving. But because it generates billions of dollars in quarterly cash flow and earnings, it can essentially get into the game in a meaningful way whenever it wants. Will it be via virtual reality? Apple, Alphabet and Nvidia are holdings in Jim Cramer's Action Alerts PLUS member club. Want to be alerted before Jim Cramer buys or sells AAPL, GOOGL or NVDA? Learn more now. It's an odd way to tackle the budding industry. Most are doing it via hardware, like sensors and cameras, or via self-driving software. Others, like Ford Motor Co. (F - Get Report) and General Motors Co. (GM - Get Report) are producing the actual vehicles for it. These are pretty standard strategies. But virtual reality, simply put, is not. While we're likely years off from seeing such a product, reports say that the company is at least toying with going in this direction. In level 5 autonomous driving, drivers are no longer necessary. So that when someone is using the vehicle, there is at a minimum one passenger. The thought is that this person can be more productive -- productive in the sense of work, education or even relaxation. In any regard, they're not driving and in some cases this can leave passengers susceptible to motion sickness. As a result, Apple is working on virtual reality applications to counteract those symptoms. Will it work? It very well could! I personally do not suffer from motion sickness (thankfully), so this doesn't seem like a product for me. But beyond motion sickness, perhaps it can be used as an entertainment option as well. Maybe Apple can find other applications to apply to the device, too. Look no further than the iPhone or the Apple Watch, capable of countless different uses. If Apple begins to foray into the user experience portion of the autonomous driving segment, perhaps that's how it can make its mark in this new growth area. It would make sense given how much time its passengers would theoretically have now that they're not driving their own vehicle. That time is another company's market share, whether it's reading news on a tablet or streaming music. Spotify (SPOT will want that time. So will Apple Music. Because hundreds of companies are already in the business making hardware, software and vehicles, Apple could carve out a unique niche in autonomous driving. The question is, will it? If it can, then it could be another growth avenue of its future.